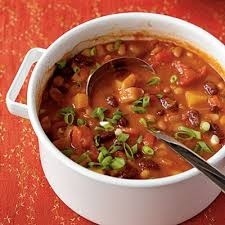 Bean Chili – Its not just for Veggies!! I’m feeling the need of something comforting yet healthy this week as work has been all out. So I thought this weekend I would dedicate to making something I haven’t made for a couple of years but I used to LOVE – My Bean Goo – or bean chili to the uninitiated!! It’s a pretty foolproof recipe and freezes amazingly!! Whats more it works well with rice, tortilla or even crusty bread so is a nice versatile treat. If its so foolproof why haven’t I made it for 2 years I hear you cry? The answer is simple – I don’t know. Its one of those recipes that I made for years but then just forgot to make for a couple of months and then it dropped off my radar – but I have a veggie friend who asked for the recipe so I thought id reinvent it!! Gently heat the garlic in the oil and then sweat off the veggies till soft. Season and serve with rice etc. Next Post Brighton BBQ day! !